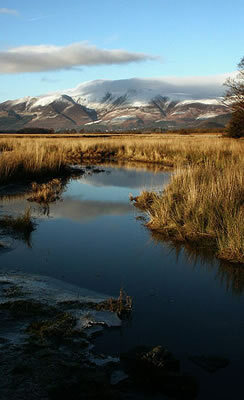 Skiddaw is the fourth highest mountain in England after the Sca Fells and Helvellyn. The lowest of the 3000 Footers, it offers the simplest ascent either via a well-trodden track starting near the summit of Latrigg or alternatively, from Millbeck via Carlside Col. The Skiddaw Massif is located to the north of Keswick and is the most dominant mountain in the area, commanding majestic panoramic views of Grizedale Pike and the Coledale Fells, Catbells, Dalehead and Newlands, Derwentwater and the distant fell tops around the Jaws of Borrowdale. Skiddaw takes the form of a north-south ridge about half a mile long, with steep slopes to east and west. The ridge continues northward over Broad End to Bakestall, a fell overlooking the Whitewater Dash waterfall. Further ridges fan out east and west from the southern end of Skiddaw. To the south east are Skiddaw Little Man, Lonscale Fell and Latrigg, an easily accessible viewpoint for Keswick and Derwentwater. Beyond these fells are the Glenderaterra Beck and the Blencathra group. The south western ridge curves round through 180 degrees to run north above the shore of Bassenthwaite Lake. This gives Skiddaw an 'outer wall', comprising Carl Side, Long Side and Ullock Pike collectively referred to as 'Longside Edge'. The final member of the Skiddaw Group is Dodd, a satellite of Carl Side. The mountain lends it's name to the surrounding areas of 'Skiddaw Forest', 'Back o' Skidda' and isolated 'Skiddaw House', to the east, formerly a shooting lodge and now a Youth Hostel. Skiddaw is synonymous with Skiddaw Slate, an early Ordovician sedimentary rock whose sediments were formed about 500mya in a shallow sea, low energy environment. Skiddaw's slopes are generally rounded and convex, looking from a distance as though a thick velvet blanket has been draped over a supporting frame. On the ridges the general terrain is of loose stones, but elsewhere all is grass and heather. Choice of route is decided at the planning stage in consultation with the group and is based on general fitness level and the preferred challenge option A, B or C.